Electric bicycles will not be allowed on the roads until they are registered and listed under the Beijing non-motor vehicle management regulations, which will come into effect on nov 1. Beijing is not the first city to implement licensing rules for e-bikes. As early as four years ago, Shanghai has started and finished the e-bike licensing work; Recently, nanchang, hangzhou, shenzhen and other cities have also carried out control over the vehicle. The regulations clearly stipulate the establishment of an e-bike product catalogue system. Improve the e-bike registration regulations; Set a transitional period policy for electric bicycles; Supplemented and improved the non-motor vehicle traffic regulations; In addition, keeping pace with The Times strengthens the management responsibility of Internet bike rental. At the same time, in order to maintain the coordination and unity between the laws, the "Beijing implementation of the road traffic safety law of the People's Republic of China > method" (referred to as the "method") has been simple and synchronous amendments, on the scooter, unicycle, self-balancing vehicle and other means of transport management has made clear requirements. According to forward-looking industry institute released "bicycle manufacturing industry production and sales forecast demand and investment analysis report, statistics show that in the first half of 2018 the national electric bicycle production statistics show that in June 2018, the national electric bicycle production reached 2.949 million, increased by 9.9% compared with June last year, production increased 5.73% in May, the national electric bicycle production 1-2 month the output of this two months to 3.081 million vehicles, compared with the same period last year growth of 6.27%. 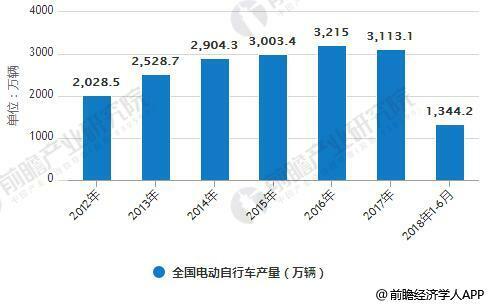 In the first half of 2018, China produced 13.442 million electric bicycles, up 7.74 percent year-on-year. From 2012 to 2017, the national output of electric bicycles increased and decreased. In 2016, China produced the highest number of electric bikes, with 32.15 million. In 2012, it was relatively small, with a production volume of 20.285 million. China's total social population of electric bicycles has reached 250 million, which can be said to be a real "national transportation vehicle", the relevant market size or more than 200 billion. With the country's "new national standard", as well as the local government's management policy has been introduced, the electric bicycle industry, which has long been considered as "barbaric growth", is expected to be further standardized, and the excellent enterprises in the industry are expected to get new opportunities in this wave of development. In fact, e-bike is not only a "national transportation tool", but also one of the most original innovative products with Chinese characteristics since the reform and opening up. This industry is a national industry featuring green environmental protection, close to people's livelihood and highly independent property rights. 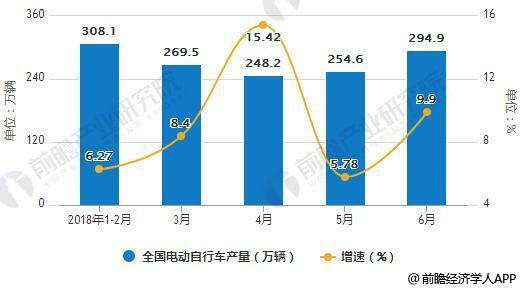 Later, affected by the economic growth slowdown and industrial structure adjustment, the development speed of the industry slowed down, and the industrial concentration began to increase. Many uncompetitive brands and manufacturers gradually withdrew, and manufacturers increasingly needed to create diversified products to meet the change of consumer preferences. With the continuous advancement of urbanization and the continuous improvement of people's living standards, people have put forward more appropriate requirements for transportation means and modes of travel. Urbanization and economic development have brought about a surge in urban population and the number of motor vehicles. Problems such as traffic congestion and urban environmental pollution have become increasingly prominent. E-bikes can also help solve these problems. From the perspective of the industry, although there have been adjustments in recent years, but the current degree of dispersion of this industry is still very high. Guo jianrong tells a reporter, at present the manufacturer in the industry has more than 800, dispersive degree is high, competition is very intense. For the adjustment of the industry, the most critical, is introduced in May this year, next year in April on the implementation of the electric bicycle safety technical specifications "mandatory national standards, standards must have the ability to pedal cycling, the maximum design speed is not more than 25 km per hour, the mass (including battery) not more than 55 kg, motor does not exceed 400 watts of power, nominal battery voltage is less than 48 v, and enforcement. This means that a large number of motorcycle models and electric bikes with a speed of more than 40km/h, which are currently shuttling through the streets and lanes, will be phased out. Lighter and safer e-bikes will enter the market. With the replacement of products and the integration of the industry, the e-bike industry may usher in a reshuffle. In 2018 the promulgation of "new gb is electric bicycle industry supply side gripper structural reform and enhancing the added value of the bicycle industry, the implementation of the specification will further accelerate market differentiation, makes the industry presents the strong stronger and the weak weaker" Matthew effect ", as part of the substandard enterprises eliminated and the adoption of new technology, industrial concentration, will further enhance product value will increase accordingly. The industry will gradually concentrate, medium-sized and small-scale enterprises, if they can not keep up with the pace of policy adjustment, it is likely to gradually close down, or be some of the mergers and acquisitions of large enterprises, because the implementation of the policy next year, the impact has not yet seen, in general, the production of exceeding standards and violations, will be greatly curtailing. At the same time, the current market e-bike homogenization trend is also relatively obvious, consumers need better, more personalized products. In the field of transportation, e-bike has rapidly replaced traditional bicycle as the mainstream way of short-distance travel due to its environmental protection and convenient features. As the e-bike market tends to be saturated, consumers have been changing from early product demand to demand for quality, function, personality and experience. In order to adapt to the transformation of consumer demand and upgrade of consumer mentality, e-bike manufacturers will focus on solving consumers' pain points in the future, abandon the traditional low-end models with poor experience, and vigorously develop a new generation of high-end models represented by intelligence, high-end and personalization, so as to improve product competitiveness and brand image. PrevUse a high-pressure cleaner to wash your car at home. NextE-bike new national standards, short-distance generation next 100 billion market will come?